The Interrotron allows the interviewee to "see" the interviewer. The Interrotron is a variation of the teleprompter and used to interview subjects. Rather than seeing text over the camera’s lens, the on-camera interviewee sees the face of the person asking the questions. Throughout the history of television, documentary filmmakers have invented the gear they need on their jobs. Ross Lowell invented the Lowel Light (and the Lowel-Light company along with it), Anton Wilson perfected the video battery and spawned Anton/Bauer, while Jim Domke invented the Domke camera bag because he simply needed a better bag to carry his camera equipment. Errol Morris, the film director, joined the ranks a few years ago by inventing the Interrotron, an invention he needed when he interviewed Robert McNamara, the former Secretary of Defense, for his 2004 Academy Award-winning documentary, The Fog of War. 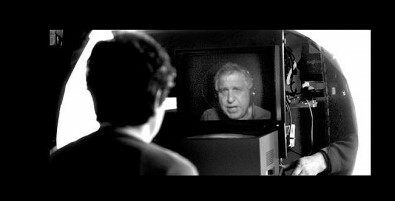 Film director, Errol Morris, solved a common interview problem, where the interviewer and interviewee cannot directly look at each other. His solution, the Interrotron, allows both people to see each other during the interview. 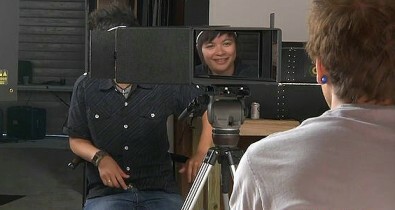 The Interrotron is a variation of the teleprompter used for interview subjects. Rather than seeing text over the camera’s lens, the on-camera interviewee sees the face of the person asking the question. The subject of the interview and the questioner can have a one-on-one personal conversation without eye contact wandering around the room. Loss of eye contact has always been a major problem for documentary filmmakers. Non-professional interview subjects are often uncomfortable in front of the camera in the first place. They tend to look off camera at every opportunity. Their eyes wander. At the end of an answer to a question from the director, their eyes often dart off camera leaving the editor without even a few frames with which to cut. The Interrotron provides a direct sight line, supporting eye-to-eye contact. The result is a more realistic dialog, as each person can perceive the others' body language. With the Interrotron, the subject looks into the face of the questioner rather than a cold camera lens. The questioner looks into his or her device and sees the face of the on-camera subject. Each person can observe the expressions and body language of the other while the interview is going on. Most importantly, direct eye contact with the person being interviewed is maintained on camera. In solving the eye contact problem, Morris solved a classic problem. Morris’s wife named the device an “Interrotron,” combining the words “interview” and “terror” because it prevented fear in his non-professional actors. The first Interrotron was a homemade affair. It entailed two cameras with modified teleprompters, displaying the feed off each other. But it worked and got Morris an Academy Award. Then Bill Milling, a director who has done 20 features and many documentaries himself, entered the picture. Director Bill Milling's American Movie Company rents the Interrotron, which includes a trained person to ensure proper setup. At this point, Milling’s American Movie Company, based in New York City and Los Angeles, were already renting Autocue teleprompters and had a green screen studio for special effects. Milling was so taken with the idea of the Interrotron, he started experimenting and building them for rental. That was five years ago. Today, the tinkering and refinement continues. Interestingly, Interrotron is not a brand. Morris did not copyright the device. Anyone can build them, but Milling has gained a reputation for continuously refining and perfecting the device through years of experience. In fact, Morris called him and is now his client, renting the devices several times from his company. The main Interrotron model in use today is the Mark III from the American Movie Company. The basic prompting equipment is from Autocue, but it has extensive modifications. It uses a 16 x 9 high-definition monitor for the talent unit. The director uses a 16 x 9 professional HD monitor with HD-SDI, HDMI, component and composite inputs. The director’s monitor allows not only eye contact with the subject, but the viewing of the exact framing, focus and aspect ratio that the main camera is getting during the recording. The American Movie Company's New York City office can supply the company’s new Skype-O-Tron, which connects a director to a remote location so interviews can be done over the Internet. The Mark III, with a trained operator, rents in the New York City and Los Angeles metropolitan areas, but can travel to other locations for extra cost. The New York rate is $795 a day, while the Los Angeles rate is $695 a day. A Mark IV unit, now in prototype, rents for $100 extra a day in New York City only. It adds speaker audio to the front of prompter so the voice of the director comes directly toward the talent from its source. The unit currently uses a push to talk microphone by the director as the research continues on how to focus the audio without getting feedback. Also available in New York City is the company’s new Skype-O-Tron, the most advanced Interrotron and one used only two weeks ago by Morris in a Boston to New York City interview for a current project. It adds the ability to connect the director to a remote location to do interviews via the Internet. “This is a combination of our top-of-the-line Interrotron with the addition of a live stream studio. It is basically an Interrotron at a distance. It has four cameras and can do a face-to-face interviews with two people at once,” Milling said. 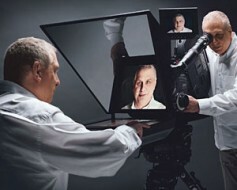 Errol Morris using the Interrotron. The following is a scene where Erroll uses his Interrotron to interview the former Secretary of Defense, Robert McNamara, for Erroll's 2004 Academy Award-winning documentary, The Fog of War. Teleprompting is a key area that lends itself well to REMI workflows. The good news is that advances in IP prompting technology have answered many of operators’ concerns about reliability and latency.